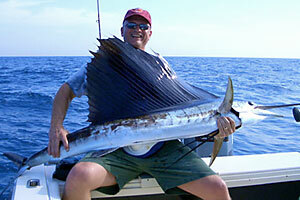 Sailfish (Istiophorus platypterus) are dark blue on top, brown-blue laterally, silvery white underbelly. Their upper jaw is elongated in the form of spear, and the first dorsal fin is greatly enlarged in the form of a sail. They grow rapidly, and can reach 4 to 5 feet long in a single year. A kite is often used while either slow trolling or drifting – although locally it’s mostly associated with drift fishing. The fishing kite’s purpose is to keep the live bait on the surface. The kite has several release clips to which your fishing line is attached. The kite suspends your fishing line and the bait right at the surface. The live bait on your hook instinctively tries to swim down or away to safety. As the live bait struggles to get away from the line’s grasp it sends tantalizing vibrations through the water column ringing the dinner bell for any nearby predators. 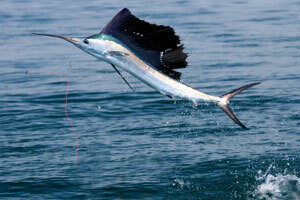 Another fascinating aspect of kite fishing is that you will often be able to see the fish strike the bait. Since the bait is near the surface, some of the strikes will be spectacular.